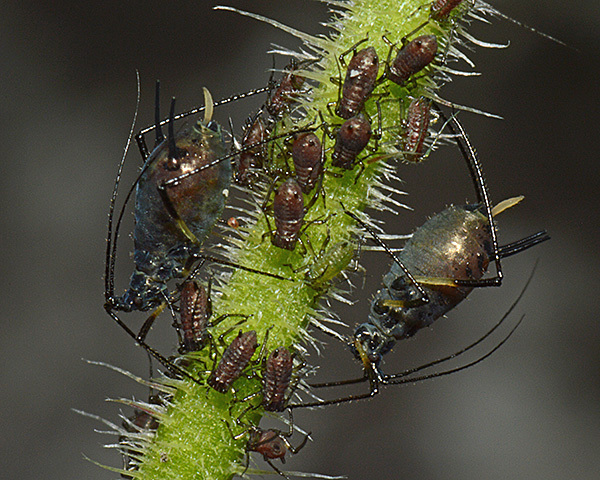 Adult apterae of Uroleucon cichorii (see first picture below) are shining metallic grey-brown with black antennae and siphunculi. The antennal terminal process is 5.4-8.4 times longer than the base of antennal segment VI. The apical segment of the rostrum (RIV+V) is 1.04-1.33 times the length of the second hind tarsal segment (HTII). Nearly all dorsal hairs arise from dark scleroites (cf. Uroleucon sonchiwhere dorsal scleroites on abdominal tergites 1-5 are either absent, or very small). The femora are yellow basally and black on the distal half. The tibiae of Uroleucon cichorii are entirely black (cf. Uroleucon grossum and Uroleucon obscurum which have much of the basal half of the tibiae yellow-brown rather than black). The siphunculi are 1.1-1.7 (normally 1.4-1.6) times the length of the cauda. 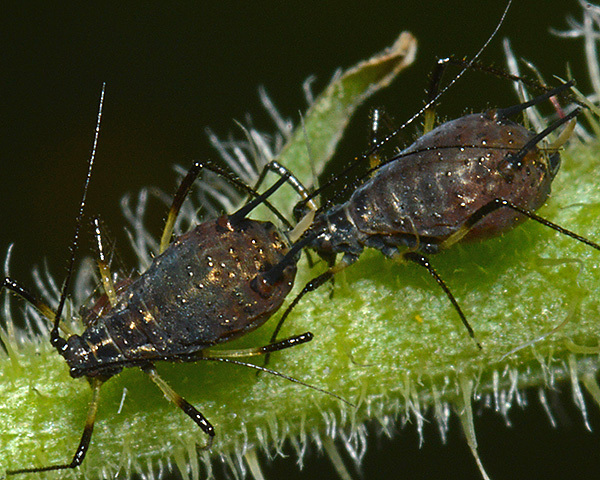 The body length of the adult Uroleucon cichorii aptera is 2.8-4.9 mm. The clarified slide mount below is of an adult oviparous female Uroleucon cichorii. Clarified mount by permission of Roger Blackman, copyright AWP all rights reserved. We have only found Uroleucon cichorii once, in late summer on smooth hawk's-beard (Crepis capillaris) in Bedfordhire. Like other Uroleucon species, Uroleucon cichorii can build up to large numbers in late summer. The hind tibiae are conspicuously black, enabling us to confidently assign this colony to Uroleucon cichorii (=Uroleucon cichorii cichorii) rather than to the closely related Crepis specialist, Uroleucon grossum (=Uroleucon cichorii grossum). The picture above shows a number of immature Uroleucon cichorii comprising both females and males. Very young immature female viviparae (and probably oviparae) are a deep reddish-brown. As they mature, most of the dorsum becomes metallic grey leaving the posterior area near the siphunculi reddish-brown. 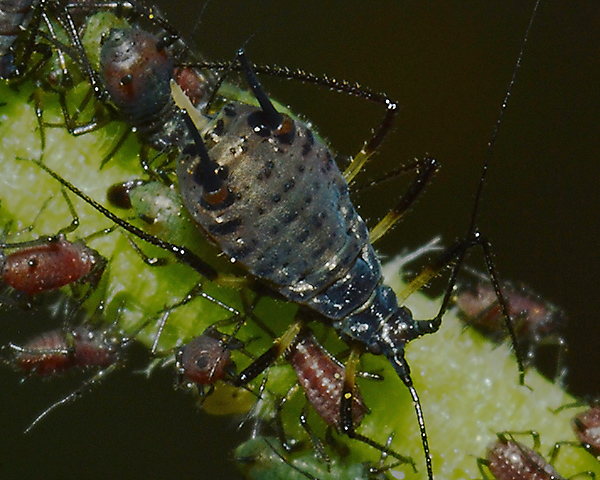 Young alate males are green - quite different from the developing females. 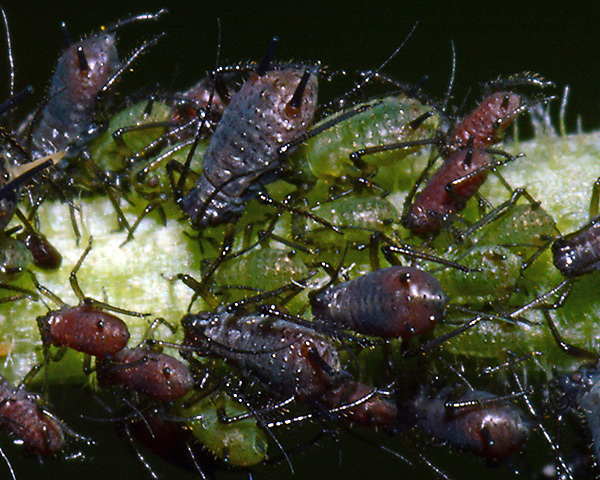 Several authors have recorded the parasitoids occurring on Uroleucon cichorii. Tomanovic et al. (2003) recorded Ephedrus niger, Praon volucre, Praon yomeneae, Aphidius funebris and Binodoxys centaureae in their review of aphidiines parasitizing Uroleucon cichorii in the West Palaearctic. Kos et al. (2012) recorded Ephedrus plagiator, Praon volucre, Praon yomenae, Aphidius funebris and Aphidius matricariae parasitizing Uroleucon cichorii in Slovenia. 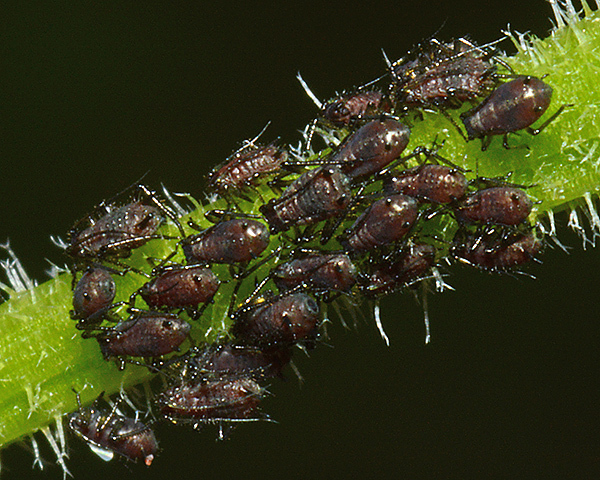 Blackman & Eastop list 31 species of aphid as feeding on chicory (Cichorium intybus) and/or endive (Cichorium endivia) worldwide, and provide formal identification keys. 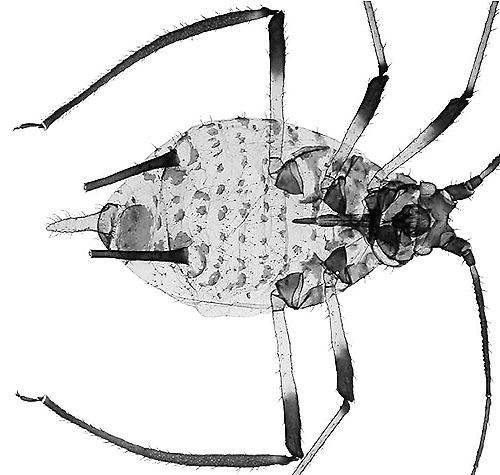 Baker (2015) lists 20 of these species as occurring in Britain: Aphis craccivora, Aphis fabae, Aphis gossypii, Aulacorthum solani, Brachycaudus helichrysi, Hyperomyzus lactucae, Hyperomyzus picridis, Macrosiphum euphorbiae, Myzus ornatus, Myzus persicae, Nasonovia ribisnigri, Pemphigus bursarius, Protrama flavescens, Protrama radicis, Trama caudata, Trama troglodytes, Uroleucon cichorii, Uroleucon picridis and Uroleucon sonchi.